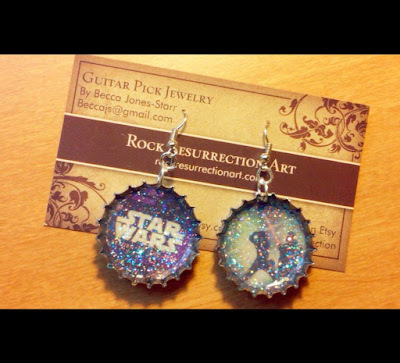 Rock Resurrection Art : Star Wars Bottle Cap Jewelry Coming Soon! Star Wars Bottle Cap Jewelry Coming Soon! After going on a little vacation and checking out some interesting jewelry shops, I came back home with new ideas to try. I'm big on repurposing items and had dozens of bottle caps I hoped I'd someday use. Bottle cap jewelry itself is nothing new, but it was something new to me. I went to work upon returning home on processing the bottle caps by putting images inside of them and sealing them. I'm in the process of finishing several bottle cap jewelry pieces. Pictured above is my first pair of bottle cap earrings! I made pieces from each movie in the original trilogy. Check back tomorrow for all the finished work.